Originally posted: September 4, 2017 . Last modified: March 11, 2019 . 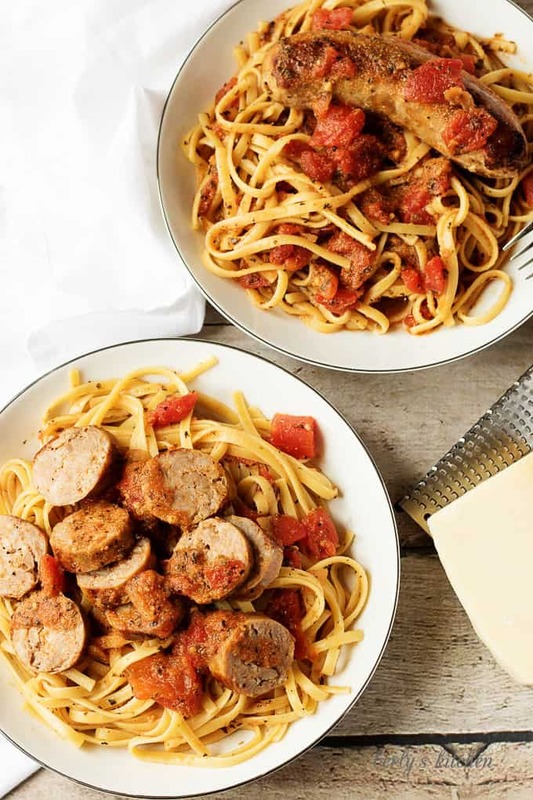 A meaty, spicy Italian sausage and tomato linguine recipe that’s perfect for a quick weeknight dinner. Proving good food doesn’t have to take all day! As you probably already know, pasta is a mainstay in our household. Whether it be a quick pan sauce or cheesy pasta casserole, we love our carbs. Well, this week we decided to share a new entry into our pasta repertoire. The star of this dish is Italian sausage, of course. The flavor the sausage gives to the sauce is amazing. One of the best things about the Italian sausage pasta is that you don’t have to use a lot of seasonings. All you really need to do is add a touch of Italian seasoning mix with some garlic and onion powders, and you’re ready to go. Salt and pepper are optional as the spices within the meat are sufficient to flavor everything. With that being said, I would still salt my pasta noodles, but it’s up to you. Another advantage this Italian sausage pasta has over others is ease. It takes less than an hour to prepare a delicious, filling meal. After a long day on the clock, you’ll be thankful to be in and out of your kitchen in under 60 minutes. Of course, you will have to cook the linguine while the Italian sausage and tomato sauce reduces on the stove. Before I go, I would like to mention one last thing. Please be careful when you add the tomatoes and the stock to the hot pan. There’s a lot of steam when this process takes place, and it’s easy to get burned. Use pot holders and don’t put your face over the pan. 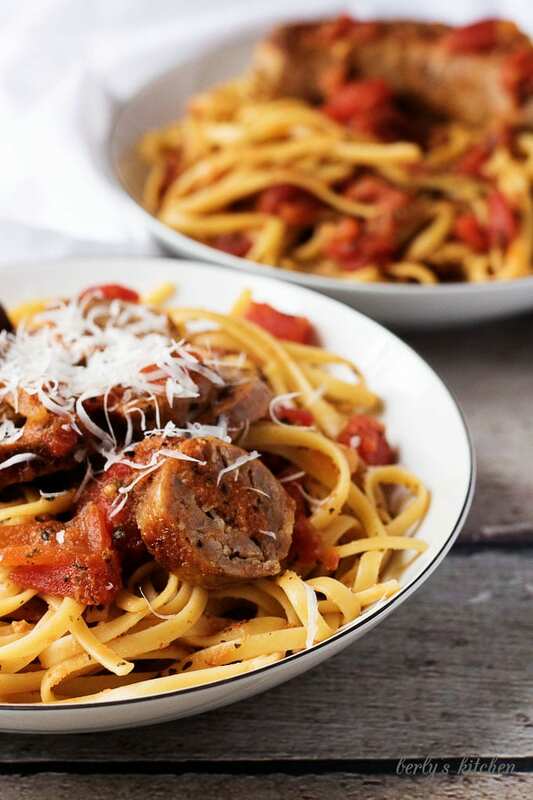 In closing, I invite you to put this Italian sausage pasta dish on your menu. It’s filling, savory, and best of all, easy to make. As always, I wish everyone a long life, love everlasting, a tummy full of Italian grub! 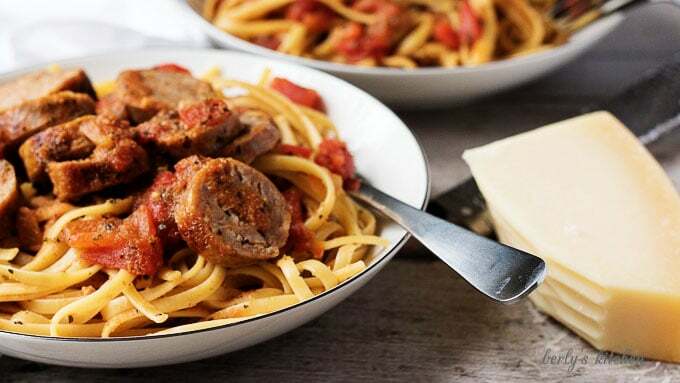 A meaty, spicy Italian sausage and tomato linguine recipe that's perfect for a quick weeknight dinner. Proving good food doesn't have to take all day! First, in a large saute pan, over medium heat, cook the sausage links. I cooked them for 7-10 minutes on each side. Once they are done, remove them from the pan and set them aside. Next, remove the pan from the heat and then add the tomatoes, chicken stock, Italian seasonings, garlic powder, and onion powder. Be careful not get burned from the steam when you add the liquid to the hot pan. Afterward, scrape the pan with your wooden spoon and stir the ingredients to get all that flavors mixed into the broth. Replace the pan over the heat and put the sausages back into the saute pan to finish cooking. Then, let the links and the sauce cook, uncovered, for 15-20 minutes. While the sauce is reducing, cook the linguine per the pasta box instructions. Last, once the pasta is done, drain the noodles and put them back into the pasta pot. By that point, the sauce should be finished. Remove the sausages and set them aside again. Now, toss the noodles with the sauce and portion out the meal onto plates. Top each dish with a link of sausage, whole or cut, and serve. The calorie count listed is an approximation based on the ingredients. Actual calories may vary. Parmesan cheese is not included in the recipe, so the calories were not added to the total. The dish can be stored in a sealed container in your fridge for up to three days. I love this! I usually make a pasta sauce with Italian sausage and puree it because my son doesn’t like chunks. I never thought of serving it whole with pasta. It’s quick and easy to make and this looks delicious! I love Italian Sausages. Ah the smell when they cook always makes you hungry doesn’t it. Great way to build the appetite. This recipe sounds so delish. Saving for later. This looks delicious. I wish this page was a menu, and I could order a plate of this. Your photos look delicious. 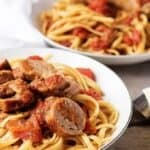 I love the simplicity of your sauce recipe, too, and as a frugal foodie, I appreciate how not one bit of the flavor from the sausages goes to waste. .
Yummmmm now that’s my kind of past dish!! 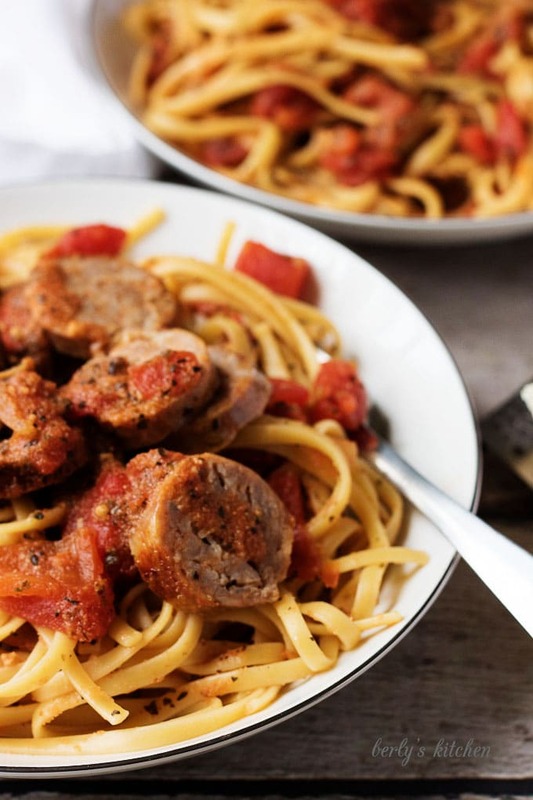 I love tomato sauce with sausage in it and so does my husband so I have to bookmark this! The photos here look just scrumptious! That’s perfect pasta recipe. Looks so appetizing .Need to try this one one for sure. I love pasta! I think I have had it twice a week for the past month. Haven’t had linguine for a while, though, Yum! This is TOTAL comfort food – perfect for the cooler weather that’s rolling in here in New York. To me, there are few dishes more satisfying during fall than a hearty pasta recipe. And this one, with that sausage? Perfect. There isn’t anything more comforting than a big bowl of pasta! This looks fabulous. 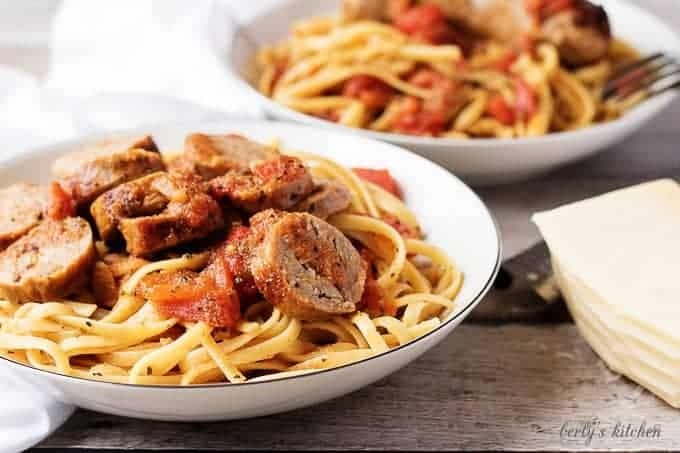 Pasta with sausage and tomatoes is food I could live on! Perfect comfort food! Love it! looks SO amazing. Definitely need to add this recipe to the menu! I made this tonight and it was a big hit! I couldn’t find diced tomatoes with garlic and onion, so I just got Italian style diced tomatoes and added a diced onion. I also added some sliced mushrooms to the sauce. Thanks so much for the recipe! We will definitely be adding this to our dinner rotation.